Wedge wire also known as “profile wire”, “V-wire” or “tri-wire” is an effective solution for many companies as it is used to filter solid particles from liquids, filtration, dewatering and other collection and distribution needs. The screens are produced depending on the industry’s standard size; however customization is also available depending on the client’s preference. Each screen consists of surface profiles which are in a v-shaped form providing precision, great resistance and longer service life. The company can produce a minimum slot of 20 microns. Non-clogging. Wedge wires are often produced in a variety of sizes and depending on the head width and profile depth, the v-shape creates slots that inwardly enlarges, minimizing and avoiding clogs caused by solid particles. Quick and Easy Maintenance. Cleaning of the screen via mechanical scraping or back flushing is easy because of its surface screen. Accurate and Precise Slot Sizes. As screens are easily customized, it is easier to create precise slot sizes that will meet the customer’s specifications. Extended Usage. 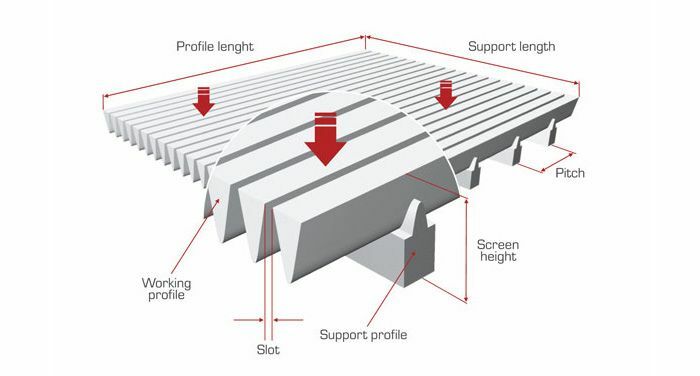 Because of the welded structure of the screen, it is capable of self-supporting itself resulting in a durable and stronger screen that would last longer than other materials. Low Cost. The structured pattern provides an effective flow resulting in high yield and lower pressure drop. Resistance to Chemical corrosion. Wedge wire screen are made of stainless steel material, resulting in corrosion resistance from chemicals and high temperatures, making these the excellent choice as compared to other screen materials.